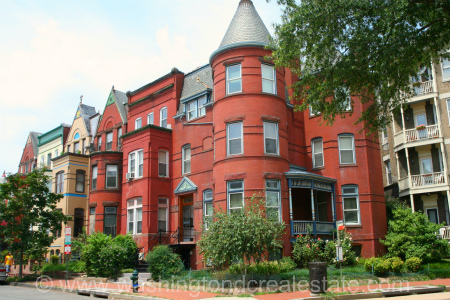 LeDroit Park is a residential neighborhood in the northwest quadrant of Washington, DC known for its elegant landscaping and diverse population. Located in the shadow of Howard University, the area was specifically developed and carved out as a suburb from rural land tracts as one of DC’s first suburbs. Initial family homes were designed by architect James McGill in the late 1870s and live on today as elegant Victorian mansions and homes. None of the 64 homes McGill designed were alike with 50 of the original family residences remaining today. The community also offers brick and framed row houses as an alternative to the more recognizable Victorian properties. LeDroit Park’s abundance of flowers and plantings comes from its original marketing as a “romantic” destination with narrow tree-lined streets. Originally a whites-only neighborhood, the community has also been home to many of the District’s African-American elite. Today the neighborhood is an incubator for urban green practices. The LeDroit Park neighborhood is served by the Shaw-Howard U Metro Station. LeDroit Park is bounded by W Street to the north, Georgia Avenue to the west, Rhode Island Avenue and Florida Avenue to the south and Second Street to the east.